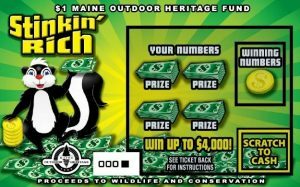 The award will allow the team to further study and interpret the vegetation on “rock glaciers” found at the base of cliffs in the Deboullie Public Reserved Lands in the north Maine woods. These formations contain subterranean ice year-round, creating a unique habitat for certain mosses, liverworts, lichens and plants. This was the 162nd round of grants awarded, totaling $260,511, to 15 different projects. The research team is composed of UMPI Assistant Professors of Biology Dr. Judith Roe and Dr. Larry Feinstein and UMPI student Bonnie Corey, and UMFK Assistant Professor of Biological Sciences and Environmental Studies Dr. Peter Nelson and UMFK student Jane Petit. The project will take place in Deboullie Public Reserved Land, located in northernmost Maine east of the Allagash Wilderness Waterway. They will be studying the interplay of the microclimatic variation and the community composition and genetic variation of moss and lichen species found in these areas. The team recently presented the findings from its first Maine Outdoor Heritage Fund Award in 2015 at the international conference “Future Arctic: Bryophytes and Lichens,” sponsored by the Université Lavale in Quebec, and team members will continue their research on this second award. In addition to their studies, the researchers will create an interpretive poster for visitors to the area, to be located at the trailhead of one of the Deboullie rock glaciers. UMPI is providing $2,000 in matching funds, and UMFK is providing the use of equipment for $2,340 toward the project. “We are asking if there are connections between the genetic make-up of the vegetation populations and the subtle variations in temperature and humidity in the rocks on which they live, which would suggest that these communities are adapted to the unique environments found in Deboullie,” Dr. Roe said. The scientists explained that these are extremely rare ecosystems for such a low elevation and likely represent refuges or places where such arctic and alpine species might be able to persist. By studying the physical and climatic factors related to the vegetation, the team hopes to determine if these ecosystems are stable or if they are at risk of change. “By learning more about how the unique environmental conditions support these incredibly diverse lichen, moss, and liverwort communities, we hope to develop strategies to help conserve them as climatic shifts lead to increasingly warmer conditions,” Dr. Feinstein said. This project was funded in part by the Maine Outdoor Heritage Fund, in which proceeds from the sale of a dedicated instant lottery ticket (currently “Stinkin’ Rich”) are used to support outdoor recreation and natural resource conservation. For more information about MOHF, go to www.maine.gov/ifw/MOHF.html. For more information about the UMPI Biology program, contact Dr. Roe by phone at (207) 768-9446 or by e-mail at judith.roe@maine.edu. For more information about the UMFK Biology program, contact Dr. Nelson at (207) 834-7683 or by e-mail at peter.nelson@maine.edu.